Challenge 7 – Learning Goals? 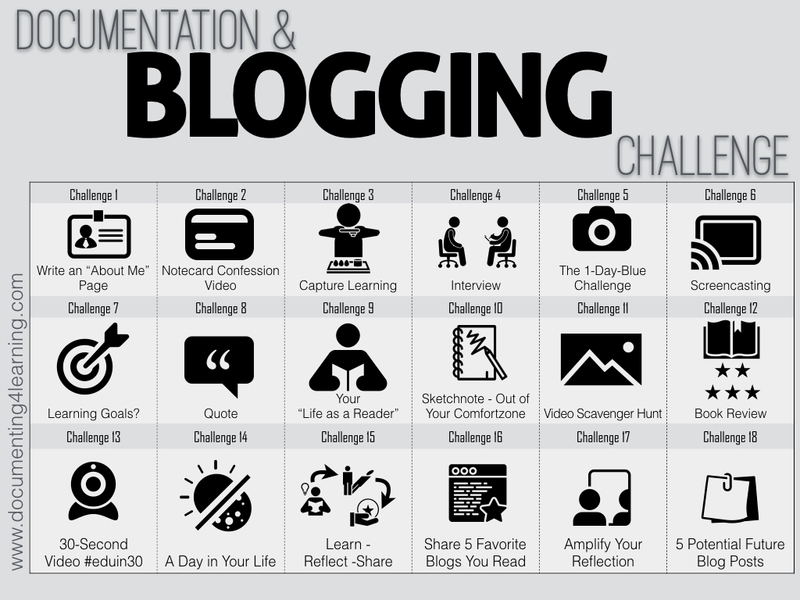 Welcome to our Documenting4Learning Blogging Challenge! The Documentation & Blogging Challenge encourages you to actively participate as a reflective and connected learner, whether you are beginning or expanding your understanding of blogging and documenting learning through meaningfully sharing and amplifying your thinking. These blogging challenges provide opportunities for you to experience how documentation supports learning—whether it is your own, your students, your faculty, or your networked community. Blogging—the act of reflectively conveying one’s thoughts, ideas, beliefs, and opinions—allows a blogger as a learner to create documentation in a variety of formats (text, images, audio/visual) that serve as a hub for his or her metacognitive and multimedia artifacts as evidence of learning over time. Why does documentation support learning? Why blogs as a vehicle for documentation? These challenges are strategically designed to help you get acquainted with the basics and logistics of blogging (creating pages and posts; engaging in the cognitive process of writing and publishing meaningful content text, images, audio and video; and linking to, reflecting on, and experimenting with different topics and styles of blogging), as well as including taking documentation–specific challenges to help you gain or expand your documentation skills and support you in moving outside of your comfort zone. To make a commitment to becoming or growing as a blogging learner: please leave your blog* address (URL) in the Leave a Reply comment section below to let us know you are starting to participate in the Documentation & Blogging Challenge. We are excited to read your upcoming posts and learn from you as a member of our Documenting4Learning community! *Note: If you have never created a blog for your own use, find out how to set one up by reading this helpful how-to guide.